Poppy Martin is 2 1/2 years old and from Whitstable. Poppy has neurofibromatosis type 1, this has caused a tumour to grow behind her left eye. Poppy was first diagnosed early July 2016 when she was just 16 months old since then she has faced 60 rounds of chemotherapy but sadly the tumour continues to grow. The tumour is inoperable in the UK. Sadly, Poppy no longer has time on her side before the tumour does yet more irreversible damage – so we need to act fast!! 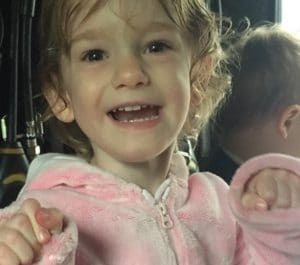 We’re aiming to reach a target of £300,000 to cover costs of travel to America, accommodation, consultations and surgery to help save Poppy’s life. Any donations will be so gratefully appreciated. Please help this little princess live a life free from this evil disease.